ATLANTIC CITY — MARCH 21, 2019 — After an incredible debut at Hard Rock Hotel & Casino Atlantic City last month, Cage Fury Fighting Championships (CFFC) will return to Etess Arena on Friday, May 17 with three championship bouts. Tickets for the card go on sale now via CFFC.tv. CFFC interim lightweight champion and Atlantic City’s own Cesar Balmaceda (6-0) will headline the card, while CFFC featherweight champion Pat Sabatini (Bristol, Pa., 10-2) and CFFC bantamweight champion Alexander Keshtov (Krasnodar, Russia, 9-0) will defend their titles at Hard Rock Hotel & Casino Atlantic City. Opponents for each will be announced in the coming weeks. CFFC 74 will be broadcast live on UFC FIGHT PASS, with veteran broadcaster Mike Gill and international superstar CM Punk calling the action. Balmaceda won the CFFC interim lightweight championship last December when he defeated Damian Norris by first-round knockout. He has won two of his last three fights by first-round knockout. Meanwhile, Sabatini is fresh off a December decision victory over Da’Mon Blackshear, while Keshtov captured the vacant bantamweight crown in a dominant win over Andre Bernardo at CFFC 71. “Cage Fury and Atlantic City are synonymous with one another. It’s exciting to bring on city-wide events such as MMA fights and I couldn’t be more pleased with our continued relationship with Rob Haydak and the CFFC,” said Joe Lupo, President of Hard Rock Hotel & Casino Atlantic City. Considered one of the best regional, developmental mixed martial arts organizations in the industry, Cage Fury Fighting Championships (CFFC) hosts events across the United States with an emphasis on cultivating the best and brightest talent in the sport. 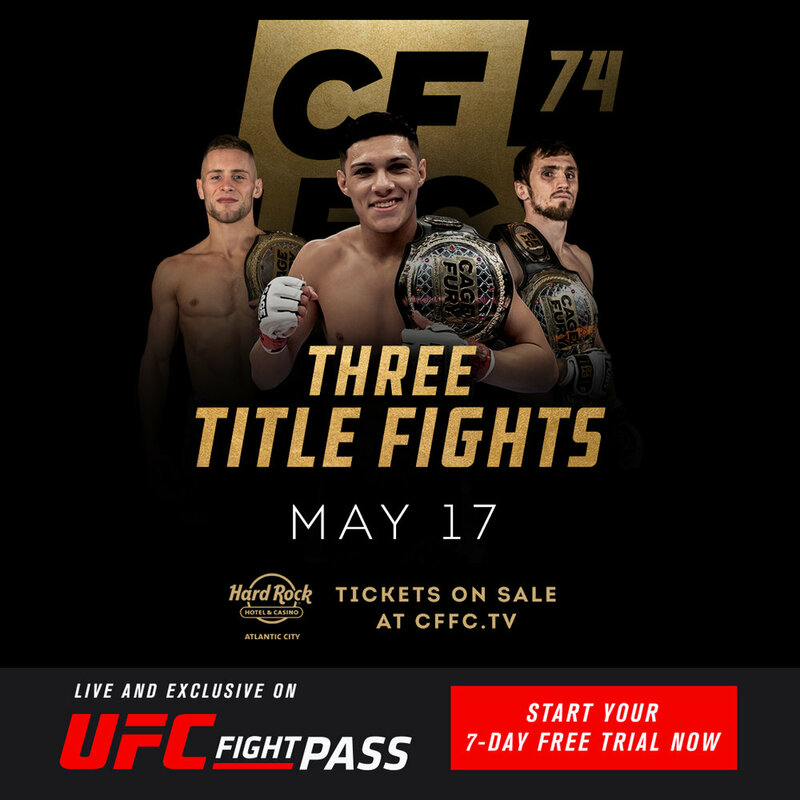 CFFC events are broadcast live on UFC FIGHT PASS, the leading digital subscription service for fight fans. Founded in 2006, CFFC has served as home to a variety of UFC stars, including Anthony Smith, Jimmie Rivera, Aljamain Sterling, Kimbo Slice, Paul Felder, Jim Miller, Nick Catone, Lyman Good, Katlyn Chookagian, Shane Burgos and Jared Gordon. Set on 17 acres, with the legendary Atlantic City Boardwalk as its backdrop, Hard Rock Hotel & Casino Atlantic City has become Atlantic City’s go-to entertainment destination, boasting 2,200 slots, 120 table games, more than 20 first-class restaurants and lounges, and world-class entertainment, including Hard Rock Live at Etess Arena, the beachside Sound Waves and Howie Mandel’s Comedy Club. The hotel and casino also features the iconic Hard Rock Cafe, overlooking the Atlantic City Boardwalk, showcasing a brand-new elevated menu and state-of-the-art stage, allowing for an amplified level of service and entertainment. Along with an endless array of upscale amenities, including world-class shopping and the brand’s signature full-service Rock Spa and Salon, featuring 31 treatment rooms, the new, music-inspired property offers lavish guest rooms and suites, with stunning views of the city and Atlantic Ocean. From family vacations and business trips to weddings, Hard Rock Hotel & Casino Atlantic City offers an unparalleled experience. Each of the hotel’s guest rooms and suites radiates a contemporary style, including Hard Rock’s signature The Sound of Your Stay® music amenity program, which allows guests to set the mood with complimentary vinyl records or jam out on a Fender guitar in the privacy of their own room. Hotel guests can enjoy high speed, property-wide Wi-Fi, 24-Hour In-Room Dining, towel and chair service at Hard Rock Beach or at the indoor pool, and 24-Hour Access to Body Rock® Fitness Center. For more information and to book your stay, please visit hardrockhotelatlanticcity.com.